Functional appliances have been used for many years in the treatment of Class II division 1 malocclusions, the selection of which varies with the type of skeletal and dental anomaly, the growth pattern, and the operator’s preference. The Functional Regulator FR was developed by Dr Rolf Frankel of Zwickau, East Germany, as an alternative to the activator-type appliances. Frankel believed that poor postural behaviour and activity of the orofacial musculature was the primary aetiological factor in producing a malocclusion. He felt that if the abnormal musculature could be altered, then so surely would the dentition be released from its influence and allow normal development to take place. 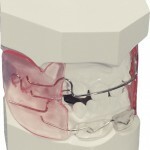 As the name implies, the actions of the FR are intended to change or regulate the muscular environment of the face and teeth, to stretch facial musculature to normal dimensions, impede abnormal activity of the lips, tongue, and cheeks, and thus allow development of the jaws and teeth in all three planes. Little doubt exists that the FR is an effective method of treatment for Class II division 1 malocclusions, but there is considerable uncertainty regarding the mechanism of the correction. It has been claimed that the FR promotes forward growth of the mandible and restriction of the maxilla, while others claim that the effects are purely dentoalveolar with little or no skeletal effects. The majority of researchers agree that there is retroclination of the upper incisor teeth during treatment, as well as agreeing that proclination of the lower incisors is a common finding, although it is maintained that this is an effect of a poorly constructed and handled appliance. There is no consensus of opinion on how the molar teeth behave in moving mesiodistally with some researchers finding restriction of the upper molars and mesial movement of the lowers, other findings refuting this. 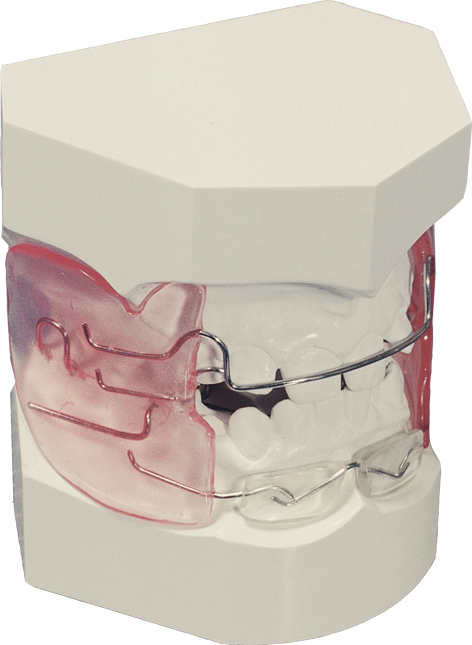 In a review of the literature Bishara and Ziaja (1989) suggest that 60-70 per cent of Class II correction is orthodontic tooth movement, only 30-40 per cent orthopaedic. 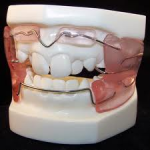 This purpose of this study was to assess the relative contributions of skeletal and dental components in correction of Class II division 1 malocclusions when treated with the FR. Treatment with the FR started at a mean age of 10.7 years, which is usually just prior to or around the pubertal growth spurt. Because the criteria for inclusion included a start age of between 9 and 12 years, the oldest patient to commence treatment was 11.9 years, the youngest being 9.2 years. Although Cohen (1980) seems to suggest that 9.4 years is the optimum age for any functional appliance treatment, he agrees with Tanner (1951) that growth spurts are very variable and that variation between individuals are very common. The range in this study of 9.2-11.9 years is seen to be representative of patients being treated at the optimum age around the pubertal growth spurt. The treatment time ranged from 10 to 23 months, with a mean length of 16.4 months. When compared with other studies this seems to be slightly shorter than average, McNamara et al. (1990) studying over 18 months, Schulhof and Engel (1982) over 21 months, and Creekmore and Radney (1983) over 29 months, however, variation in response to treatment with the FR has to be considered. One of the main determining factors in the length of treatment time is the co-operation and compliance of the patient—if the appliance is not worn full time, then the treatment time is obviously increased. The growth in the untreated control group was studied over a similar period (mean 17.3 months, range 11-23 months) and matched well the starting age of the FR group. The way in which the FR is held in the mouth when the mandible is postured forwards places a reciprocal force acting distally on the maxilla. The theory is that the normal forward growth of the maxilla is inhibited or even reversed to effect distal movement of the maxilla relative to the cranial base, a situation which Hotz (1970) said would be ideal for correction of a Class II skeletal discrepancy. In a study, the mean movement of the maxilla was −0.2 mm, which in terms of the pitchfork analysis represents a very small increment of forward growth in an anteroposterior direction in spite of the forces redirected via the FR. The equivalent result in the control group of −3.1 mm represents the normal mean maxillary growth relative to the cranial base. As would be expected all the control cases demonstrated negative values for Max., this representing normal forward growth of the maxilla range −1.1 to −10.2 mm. That the FR is unable reliably to fully restrain forward maxillary growth is evident from the most unfavourable value recorded of −7.1 mm. and the fact that 32 out of the 63 FR cases demonstrated a negative result. The most favourable value of 5.8 mm on the other hand represents a significant restraint and probably distal movement of the maxilla. These findings agree with some authors, Owen (1981, 1983a, b, c), Neilson (1984), and Creekmore and Radney (1983) all finding some degree of decrease in forward growth taking place. The difference between the mean maxillary movement of the two groups was a highly statistically significant factor and suggests that a good deal of the Class II skeletal correction was restraint of the maxilla. This entry was posted in Orthodontic and tagged abnormal musculature, Class II div I malocclusion, frankel appliances, functional regulator, mandible, maxilla, molar teeth, orthodontic tooth movement, puberty growth spurt, retroclination on April 26, 2012 by chzechze.